The Mother Nature Collection ready for launch at Olympia Beauty! 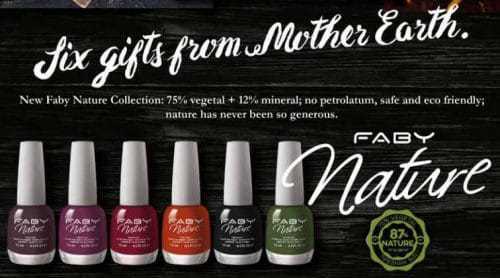 The Mother Nature Collection from Faby, ready for launch at Olympia Beauty! Six more gifts from Mother Earth. Love the Earth, feel it’s strength and it’s spirit. Seek beauty through nature, you will be enchanted and fascinated by it’s simplicity and generous harmony of colours. Allow yourself to be captured by the strong colours of it’s fruits, in an inviting game of contrasts. All this is captured in six new colours of the Faby Nature collection, varnishes with a green core: precious tributes to mother nature and her creative force. An irresistible palette to touch the soul and enhance the femininity of today’s woman, still capable of being amazed, of experiencing intense emotions and for whom beauty means at one in full harmony with the world. The vital essence of the Earth explodes in Faby Juice red, the heart vibrates in the green forest of Mother Nature, the senses become intoxicated with notes of spicy Cinnamon and the more classic Black Pepper, eyes are lled with charm against the deep pink Orchid and the mind is enchanted by the intense Aubergine Must. All Faby Nature varnishes are the result of a formula devoted to personal well-being and environmental protection, with 87% of their ingredients of plant origin, obtained from processing wood pulp, cotton, corn, cassava and other raw plant materials not derived from oil. These varnishes are easily and evenly applied, providing excellent, long-lasting coverage, deep, bright colours and fast drying times. They are “Big 10 Free” (no formaldehyde, DBP, toluene, formaldehyde resin or camphor) for the full respect of natural nails and they are cruelty-free, to protect animals. Faby products are distributed worldwide by Faby Line and sold in the best perfumeries and in the most prestigious beauty centres and beauty salons. Directly from mother nature, pure vitamin energy for the beauty of your nails. Vitamin Energy for nail beauty, a certi ed organic green cocktail for B-Base Nature. This exclusive transparent nail base coat is the latest Faby creation, made from natural ingredients. has reinforcing and protective properties. Not only do the strictly natural solvents increase the organic performance of the product and the special green cocktail – a super concentrate of vitamins, mineral salts, nutrients and anti-oxidants obtained from the active ingredients of Spinach, Avocado and Green Tea – helps maintain the beauty and integrity of the nail structure. A real nectar, enclosed in a revolutionary formula with herbal ingredients certi ed as organic. B-Base Nature allows nails to regenerate, improves their exibility and, by forming a protective and waterproof lm, protects them against breaking. It is also able to create a strong bond between the nail and the nail varnish, ensuring easier application and more uniform colour, perfect adhesion and an ultra-bright nish. If used daily, B-Base Nature protects and visibly regenerates the nails, giving them a healthy and nurtured appearance. For use in a salon or at home, B-Base Nature completes any manicure treatment. Suggestions for use: Apply a thin layer of B-Base Nature on clean nails, before applying varnish. For a more natural manicure, we suggest using this base together with the coloured varnishes from Faby’s Nature Collection. Available to buy and view at Olympia Beauty 2017! Faby will be on stand E50.